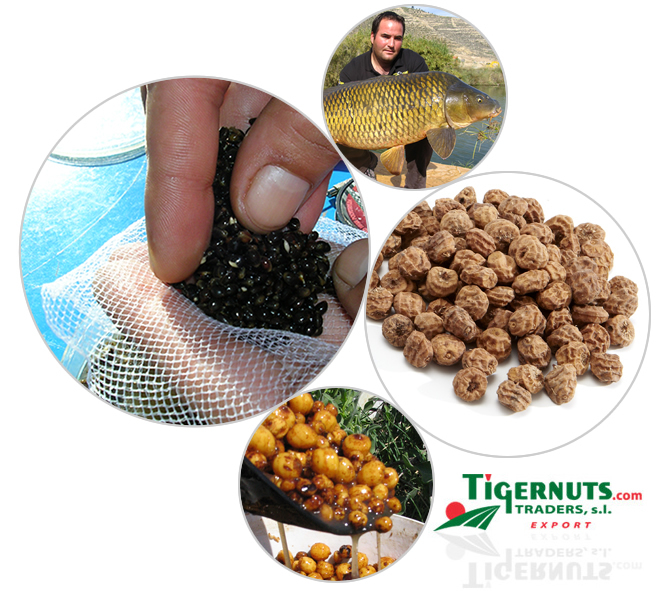 After several years working together with some of the most important European companies and carp anglers, our company, Tigernuts Traders, S.L. has decided to develop a 100% natural products catalogue to ensure the most efficient catches. We are specialized in particles, and particularly in Tigernuts, probably the most efficient and widespread particle you can find at the moment. It was after the arrival of the “hair” (before its appearance the bait was prepared directly on the hook, losing part of the sticking capacity. The hair permits the bait to hang directly from the hook) when this kind of particles of hard consistency when Tigernuts were used for Carp Fishing and its extraordinary acceptation in carps was demonstrated. The particles we can offer are: Tigernuts (All sizes); Giant Maize; Maize; Hemp; Peanuts; Mapple Peas; Lupins; Beans; Chickpeas. Likewise, we have the same range of particles ready to be used, preparing them in a complex process that permits the product preserve itself for a long time-period without losing any of their properties. We invite you to know more about the products we offer, how and when use them and how to make your fishing days more satisfactory directly through our webpage. Tigernuts Traders has developed a unique packaging for Tigernuts: VACUUM PACKAGING.